Though explaining what copywriting is may at times prove challenging in itself — you’d be surprised by how often writers are asked if it has anything to do with an ad about stealing cars — with the recent introduction of UX writers into the scene, making sense of these roles has increasingly become more problematic. Nevertheless, today, Software Planet would like to shed some light onto the many differences between these important positions, and discover whether or not a single individual at your company may successfully be able to fulfil both roles. For the uninitiated, “copy” here is simply another term for text. As a result, the easiest way to explain this role is to direct the reader’s attention to the colossal amounts of promotional articles that are currently available online. After all, in this day and age, anyone hoping to sell anything on the internet is expected to generate fantastic written content. Consequently, a copywriter’s main priorities are to inform, educate and convince, but ultimately, make a sale. 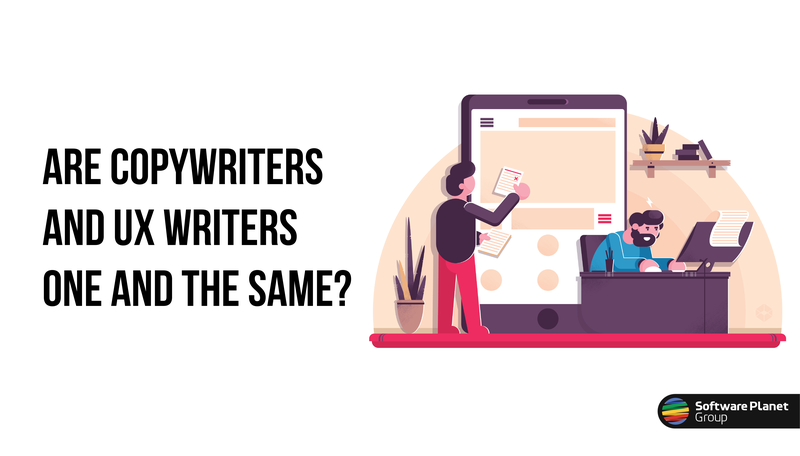 Another noteworthy characteristic is that unlike UX writers, copywriters not only are happy to work alone, but may also thrive in such lone-wolf environments. Yet this, of course, does not mean that they will never work with marketing teams. In fact, they often do, but for the most part, contact may be reduced to initial guidance and instruction. The copywriter position, however, is undeniably evolving. In the past, for instance, when working on software projects, it was the copywriter who was responsible for first penning the text which would then serve to shape the entire design process. Yet as user experience increasingly took centre stage, a new role was needed to fill the ensuing void. By contrast, because user experience (UX) takes precedence today, UX writers must be able to structure their text around the original design work envisioned by the UX team. So much so, in fact, that it is not unusual at all for UX writers to be asked to somehow wedge their text into a limited — often tight — space without compromising on font size or quality. This may seem unreasonable at first glance, but to many writers, it is actually a welcome change of pace, as it challenges them to write sentences both concisely and compellingly. And unlike copywriters, because UX writers work with captions, menus, buttons, headings, hints and other key items that are essential to the final product, they would likely be doomed if they didn’t shadow the design team. For this reason, they’d be wise to be involved in the design process from the earliest stages of the project, as this enables them to understand how end users think and behave, and gain a deeper understanding of the technology driving the product. Put simply, therefore, a UX writer’s job is to complete the product experience through clever use of text that efficiently assists users with the present task at hand. So that’s it from SPG! It is worth pointing out, however, that because written language is the most human aspect of your product, it requires a great deal of attention and will be needed at different times. This is why both copywriters and UX writers are indispensable for your product’s longevity. Though the core talent of these positions remains essentially the same — a degree in journalism or creative writing will usually suffice — and switching between roles is certainly not unheard of, because the focus is different, it would probably be best to hire a different person for every role. On that note, by the way, remember that while copywriters tend to be good at absorbing information fairly quickly, a UX writer’s strong suit is their ability to polish and simplify. And above all, please, make sure they’re not out for your car.